In her 91st year, the Queen turns grey on the Scotland 2nd class stamp. In what is probably a move to reduce costs, the silver plate is slowly being removed from Royal Mail's country definitive stamps. 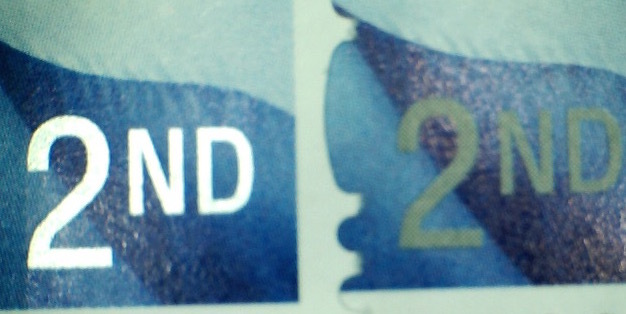 The latest (23/02/2016) reprint of the Scotland 2nd class stamp has the face value and royal profile head printed in grey instead of silver. This can be done with the black ink, and therefore no silver ink is used, and one less printing plate is required. 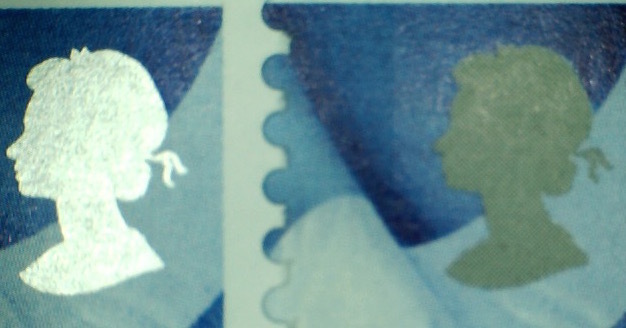 The 2nd class follows the Scotland £1.05 tariff change stamp which also has the head printed in grey, although the face value is reversed out, and shows as white. Just checked my regional tariff change stamps, the England stamp seems to have suffered the same fate as Scotland, Queen's head gone from Silver to Grey. Although the face value remains white. Yes I modified my blog write-up of the tariff stamps - I hadn't noticed that the England £1.05 was grey. I have just looked at my ISP Country stamps and the 1st and 2nd class England stamps both seem to have a grey Queen's head, though somewhat different than the £1.05 stamp. All the rest are silver. All my country stamps were supplied by Tallents House. Has anyone else noticed this ? When did you get these? Use of grey is fairly recent: the £1.05 for England and Scotland are both grey.